The Global Climate Finance Project was a joint venture of NYU Law’s Institute for International Law and Justice and the Frank J. Guarini Center for Environmental and Land Use Law. 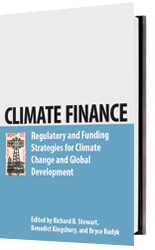 The project focused on the design of climate finance mechanisms and the institutions and governance mechanisms required to ensure that the decentralized climate finance system functions effectively. The regime must not only mobilize needed resources and ensure efficient and effective use of these resources for climate protection and low carbon development, but also build mutual trust and confidence through broadly acceptable and effective governance arrangements. The project drew on the expertise of NYU Law faculty in climate change, environmental law, development finance, international trade and investment, international transaction taxation and tax policy generally, global institutions, and global regulatory governance. It was closely linked to both the IILJ’s Global Administrative Law project and the Finance and development program.